Choosing an executor for your will may not feel quite as personal as picking a guardian for your kids, but you should think carefully about who to put in charge of your money after you're gone. "A common adage in the industry is to name your enemy as your executor as a means of revenge," says John O. McManus, an estate attorney and founding principal of McManus & Associates in New York City. "It's a thankless job. If you appoint someone you love as executor, get your house in order. Otherwise, appoint someone you do not." If you know someone with a law degree or an accounting background, they may be a good choice to serve in the role. However, many people choose their closest relatives. If you ignore this important task and don't appoint an executor, the court will pick one for you. That person may or may not be a member of your family -- and even if it is a relative, it may not be the ideal choice. Before you decide, think hard about what you're asking this person to do. We talked to McManus about what it means to be an executor and how to go about choosing one. Collect assets and information on beneficiaries. Determine debts and other claims against the estate and pay legitimate claims. Determine and pay all taxes. Distribute the estate to beneficiaries pursuant to the will or intestate statute. A: While it's not necessary to have a financial or legal background in order to be the executor of an estate, it certainly can be helpful. A law firm can perform most of the tasks associated with the estate administration, but the executor must make all final legal and financial decisions with the information provided by legal and financial professionals. It's recommended to have legal counsel and financial advice, as courts look more kindly on fiduciaries who seek outside professional help when making important decisions about estate assets. As: Being the executor of an estate can eat up a few hours a week during the beginning and end of the administration, with less time required during the longer middle period. If the decedent had his or her affairs in order, the job of the executor can be greatly minimized. The executor can also retain legal counsel to perform a majority of the tasks associated with the estate, at the expense of the estate. %VIRTUAL-article-sponsoredlinks%There's a cycle to an estate administration, with a flurry of activity at the start with probate of the will in the surrogate's court, the initial gathering of assets and payment of initial expenses. Thereafter, the less glamorous work starts: to marshal all asset information by sending letters to financial institutions and to prepare the required estate tax returns. The estate administration may last from one to two years, on average, with a litigious matter dragging on for many more years after that. A: Traditionally, having only one executor is thought to be easier; the paperwork and time spent on court proceedings and official business is reduced with just one. However, there are situations when more than one executor is helpful, especially if the elderly surviving spouse is assisted by an adult child of the deceased or two adult children remain involved in the estate of their deceased parent. A: Consider ensuring that the executor you appoint truly loves you enough to agree to the nomination -- seriously. Additionally, it's best to name a few successor executors. The worst situation may be to have the court make the decision about who will serve as executor of your estate. A: The nominated executor can renounce the appointment and not serve as executor. In that case, the successor executor may be appointed. The renunciation is typically a simple procedure in the court with paperwork to be completed by the renouncing executor and signed in front of a notary public. Q:Can you get compensated for the time you put in as an executor? A: The executor fee is calculated in many states as a percentage of probate assets, not time spent. Probate assets mean the decedent's assets that pass through the estate and not by beneficiary designation or by operation of law to a named beneficiary. The executor's commission is determined by state statute and is taxable income to the executor in the year received. The executor may still take a commission even if he or she is also a beneficiary of the estate, but many executors waive their right to the statutory fee for one reason or another. A: Irrespective of whether the executor is paid for his or her work, the executor is held to high standards in many courts, and charges may be brought by beneficiaries if the executor spent estate assets unnecessarily, oversaw a diminution of estate assets due to lack of diversification in investments, or otherwise betrayed the trust of the beneficiaries. A: Executors are often caught off guard by personal property issues. They're careful with a large annuity or an investment account, but actually things like photo albums are the most difficult to marshal. Warring beneficiaries could hire separate counsel over that. Have Mom and Dad clearly identify items and to whom they should pass -- use masking tape and marker for initials on the bottom of items or make a detailed list. 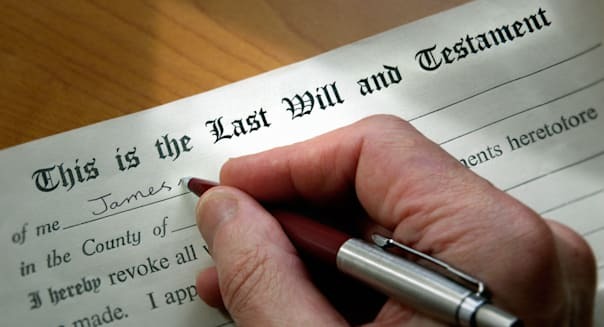 The will directs what should happen to personal property, but in situations where there's a question of who should receive something, the executor has the final say. Our wills use the language that personal property should be divided in substantially equal parts, but the executor has a lot of leeway there. To keep estate bills down, it's best to involve fewer attorneys. If you can avoid litigation, the assets of the estate can be more easily preserved. Some of our clients direct that everything be sold so that only liquid assets will be passed to heirs. New Jersey imposes both estate taxes and inheritance taxes. Estates greater than $675,000 have to pay state estate tax, with rates on the assets in excess of that amount going as high as 16 percent. That tax comes directly out of the estate of the deceased person, reducing the amount heirs eventually receive. In addition, inheritance taxes impose a hit on those who receive money from an estate. Certain family members are exempt from the tax, including the spouse, parents, grandparents, children, and grandchildren of the deceased. But siblings and more distant relatives generally have to pay tax at rates between 11 percent and 16 percent, and the tax can apply to transfers as small as $500. Maryland also has a dual estate tax and inheritance tax system. For assets in excess of $1 million, estates are subject to graduated tax rates of up to 16 percent, and inheritance taxes of 10 percent are charged to non-exempt heirs. Maryland has somewhat broader family exemptions, including siblings, spouses of children, grandchildren, and other direct lineal descendants. But the exemption amount for others is only $150, and the inheritance tax is a flat 10 percent. Rhode Island only has an estate tax, which it imposes it on estates larger than $910,725. For assets in excess of that amount, the same set of tax brackets applies as in New Jersey and Maryland, up to a 16 percent maximum rate. Indiana doesn't have an estate tax, but it does have an inheritance tax with a wide range of rates. Real property gets taxed at rate ranging from 1 percent to 10 percent, but most financial assets have higher rates of 7 percent to 15 percent, and rates on business interests start at 10 percent and go as high as 20 percent. Exemptions differ depending on your relationship to the deceased person. Your spouse has an unlimited exemption, and parents, grandparents, children, and grandchildren have $100,000 exemptions. But other family members only get between $100 and $500 before the taxes begin to take effect. However, Indiana is phasing out its inheritance tax by reducing the tax by 10 percent for those receiving bequests in 2013. That reduction will gradually get bigger in the coming years, but the tax is not slated to disappear until 2022. Nebraska also has a sole inheritance tax, with rates that go as high as 18 percent. Spouses are exempt, but parents, grandparents, children, grandchildren, and siblings have to pay tax of 1 percent on any asset they inherit in excess of $40,000; more distant relatives like aunts and uncles or nieces and nephews pay 13 percent of what they get above $15,000; and others pay the 18 percent of any inherited amount above $10,000. On the other side of the coin, Ohio repealed its estate tax effective Jan. 1. That's obviously good news for potential heirs. But it will cost local governments more than $200 million in revenue that they've come to rely on, especially in areas with substantial numbers of elderly citizens.